Its 1st July and we are in the second half of 2015 couldn't guess how fast months move on.Although it goes the same way we all feel that days are passing very fast.I pray that God must grant his mercy to fulfil all my resolution i took at the beginning of the year.If you too are in the same situation don't lose hope firmly believe in God and do you best and surely you will achieve it with HIS great mercy. Sunday meal is always special with either biryani or fried rice or pulao with a must chicken/mutton/beef. Sunday while thinking what to make for lunch a thought rose to make this coconut milk rice and made it.It was super tasty with very mild spiciness and i am sure kiddos will surely like it. 1.clean and soak rice for 15 mins. 2.Heat oil +ghee in a thick bottom pan ( i used my pressure cooker).Add in all whole spice and saute fora while followed by green chilly. 3.simmer the heat and pour the coconut milk.Add in salt,turmeric powder & pepper power.Cover and cook for it to just forth. 4.When it starts to boil add in the drained rice.Cover and cook again.when its half cooked,remove the pan from direct heat and place it over a iron tava.cook it low flame. 5.In about 10 mins your rice will be ready. Serve hot with any spicy veg or non-veg gravy.We had it with kadai chicken. We can also pack this for lunch box. 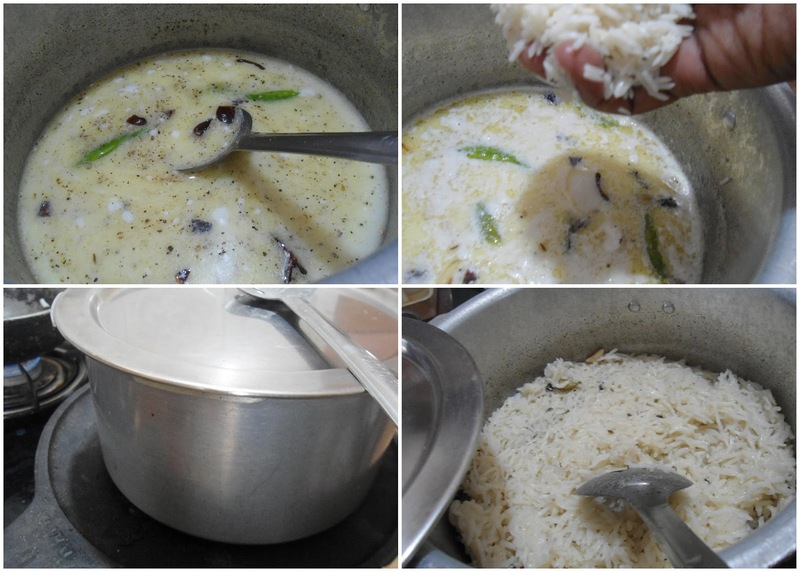 1.I used coconut milk powder to make coconut milk.You can make it with fresh coconut milk also. Such a delightful simple rice! This simple rice can make a perfect accompaniment with any curry. This is just so flavorful... perfect with any spicy curry!